While we don’t currently do such things as ‘Game of Show’ here at B3 (add that one to the chalkboard, Deirdre), I would gladly give Steamhounds that award when it came to the recent Play Expo London event. Steamhounds, from Stray Basilisk, is a multiplayer, turn-based, strategy game with one foot firmly planted in the rose-tinted realm of nostalgia, while the other is positioned within modern mechanics and trends. It makes for an interesting combination and a thoroughly enjoyable experience for fans of the genre. Each of Steamhounds’ battles take place on a screen populated by two three-by-three grids. Each player then places their three characters down on the grid — think of them as heroes, champions or classes; each is unique. Positioning is critical, with the depth of three being reminiscent of JRPG ‘row’ placement. The lane, or horizontal row, is also important, as many character attacks can only attack within the same row. Where the game gets extremely interesting, however, is when it comes to how the turn structure works. 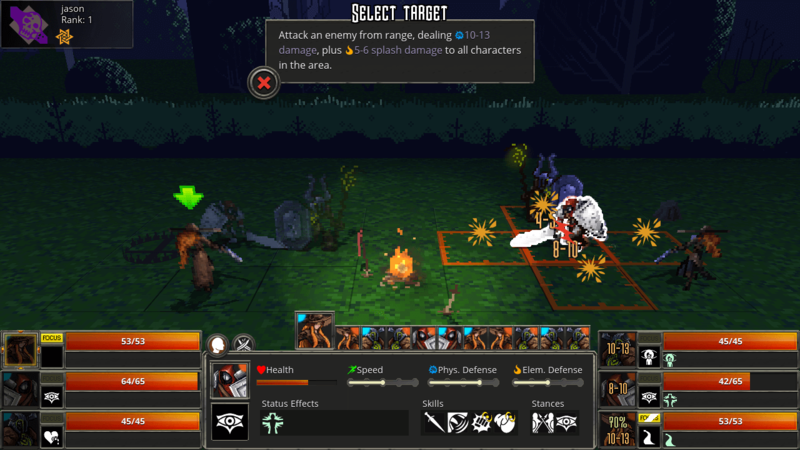 Each character takes turns like a classic turn-based game, but each turn is made up of three components — an action, a movement, and a second action, called a stance. The first action is more of an active ability — most of these are attacks, status changes or healing. The movement is simply a case of selecting one of the other slots on the board to move to (or remaining in place). It is the second action, the stance, that is the most interesting. This second set of actions is made up of effectors or reactions: clever things like attacking anybody who is attacked in the same lane as you or attacking the target of your selected ally. With some clever forward planning (or even just stacking onto your next moving character), these moves greatly improve your combat effectiveness. I was really taken aback by how clever the combat design was. This was partially down to the appearance of the game — seeing three versus three 2D sprites on a (deliberately) low-quality grass texture sent me into the game thinking that it was simply a combat sample for a somewhat elaborate Final Fantasy tribute. It was also largely down to how different each of the characters was and the depth added through the stances. It only took me a couple of turns to get to grips with the game — as soon as I realised what was going on, I quickly targeted the enemy healer and got to work on whittling them down to nothing. I was extremely impressed with the five heroes I played with while at the event and, while balancing as the roster scales is going to need to be a major focus, I’m definitely looking forward to playing more of it. Steamhounds is currently early in development, so there is no release date available. For those interested in finding out more about the game, you can follow the devs on Twitter or join the team’s Discord in order to get access to a demo build of the game.